Western Blot analysis of extracts from various cell types using AFAP1L2/XB130 (D4A5) Rabbit mAb. Immunoprecipitation of AFAP1L2/XB130 from A-431 cell extracts using Rabbit (DA1E) mAb IgG XP® Isotype Control #3900 (lane 2) or AFAP1L2/XB130 (D4A5) Rabbit mAb (lane 3). Lane 1 is 10% input. 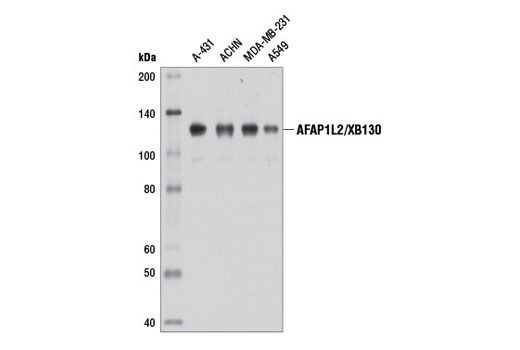 Western blot was performed using AFAP1L2/XB130 (D4A5) Rabbit mAb. 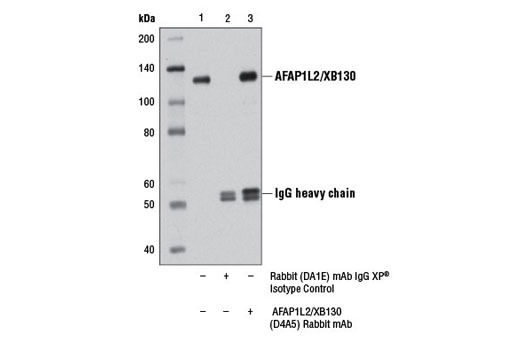 AFAP1L2/XB130 (D4A5) Rabbit mAb recognizes endogenous levels of total AFAP1L2/XB130 protein. Monoclonal antibody is produced by immunizing animals with a synthetic peptide corresponding to residues surrounding Val391 of human AFAP1L2/XB130 protein. The actin-filament associated protein (AFAP) family consists of AFAP1, AFAP1L1, and AFAP1L2/XB130, a group of structurally similar proteins that play distinct roles in the regulation of cytoskeletal dynamics and signal transduction. Actin filament-associated protein 1-like 2 (AFAP1L2, XB130) is an adaptor protein that regulates signaling downstream of multiple kinases, including Src, Akt, and the thyroid specific kinase RET/PTC (1-3). Through these pathways, AFAP1L2/XB130 mediates transcriptional regulation, cell proliferation, motility, and microRNA expression (4,5). Research has shown that AFAP1L2/XB130 is involved in the proliferation and survival of thyroid tumor cells (6), and may have value in gastric cancer prognosis (7). Xu, J. et al. (2007) J Biol Chem 282, 16401-12. Shiozaki, A. et al. (2012) PLoS One 7, e43646. Lodyga, M. et al. (2009) Oncogene 28, 937-49. Lodyga, M. et al. (2010) J Cell Sci 123, 4156-69. Takeshita, H. et al. (2013) PLoS One 8, e59057. Shiozaki, A. et al. (2011) Am J Pathol 178, 391-401. Shi, M. et al. (2012) PLoS One 7, e41660.